The model frame uses two Tangent Scale Models short Type 30 frames. The Tangent frame is lengthened by four feet for an end platform dimension of 35’-10 ½”. I used as much of the ends of the top of one frame and a middle section of another to get the extra four feet. The bottom plate was the opposite with as much of middle between the bolsters being used. This provided an overlapping joint in the frame which was reinforced with styrene. After lengthening the frame, the assembly was pretty much as per the Tangent instructions. Cal-Scale brake AB system parts and Yarmouth Model Works sill steps were substituted for the kit parts. The saddles at the bolsters were sanded to fit the larger 8000 gallon tank, a resin tank casting done by Tom Madden. As an alternative, an InterMountain tank can be converted for this project. As this car will be painted for one in food service no warning placards are needed. Instead small route boards were installed. The dome vents were also removed and replaced by one from Owl Mountain Models. The car is in the paint tray waiting to be painted, but some shiny things on the layout have distracted me. I’ll share a final image soon. Yes I do, Phil. Also a replacement tank for the Speedwitch N.A.T.X tank car kit. Frank did the patterns for both, eliminating all the fussy work involved in modifying Intermountain tank shells. I’m out of both at the moment but will be casting more very soon. Contact me at pullmanboss (at) yahoo (dot) com for price and ordering info. I don’t advertise in the traditional sense, preferring to build up a stock of 40 or so castings and then make a one-time announcement on the Yahoo Steam Era Freight Car List. A kitbashed Tangent underframe is much better than the resin one in the Sunshine kit – and easier to make, as well. 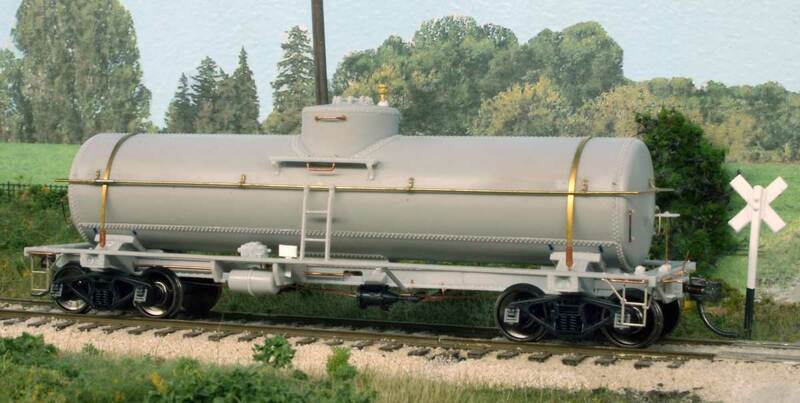 It helps if you have a Tangent 6K tank car kit as a reference so you can see exactly what parts you need to buy. At a minimum you need the underframe top, the sprue that contains the underframe bottom and the detail parts sprue. You need three of each of those to make two lengthened underframes. (The detail parts sprue has four cavities for the little bolster end inserts that contain the poling pockets. but one of them doesn’t fill – at least it didn’t on the half dozen I have.) You can save yourself some additional work if you also get one each of the Tangent wire parts, etched parts and brake line parts sprue for each lengthened underframe. It looks like an interesting build. But having to sacrifice two $38 Tangent kits (unless they sell they frame separately), and having to come up with a tank (IM or otherwise), seems like the long way around the barn. The Sunshine kits are still out there on the secondary market, and the last two tank cars I picked up were in the $60-65 range. Or does this model represent something different than the Sunshine 87.x series? Nonetheless, I am very glad to now have a copy of the GATC plans, so thanks! Dave, there is a link to the Tangent parts page. GATX tank car underframes are available for $4. Thanks RC. I had not drilled down far enough on the Tangent page to find the parts. Very good to know. My, that is pretty. Lovely work!